Thank you for your interest in our Hatha Yoga Teacher Training program. We have been registered with the Yoga Alliance® since 2000. I have been teaching yoga for over thirty years and training teachers for over twenty. To guide you on the journey from student to teacher I have included what was most meaningful when I did my training. With the help of our experienced teaching staff we have incorporated information, tools and techniques that will prepare you to start teaching students of all levels. I know a new path can be daunting, but it can also be very exciting. The entire staff is here to provide inspiration, guidance and support. Register today to reserve your place in this life-changing program. Please email or call if you have any questions or would like to schedule an interview. See our FAQ's for additional information. "Being exposed to some of the best yoga has to offer by way of the training programs at Kripalu, I can honestly comment to you that the Teacher Training programs you have in place at YC are on par with the best! You have created very comprehensive training programs and your hard work is making a difference. The focus on safety and the detail to accuracy that you have incorporated into the training programs is impressive and very much appreciated." The Yoga Connection is a Yoga Alliance® Registered Yoga School. Completion of the course makes you eligible to register with Yoga Alliance®. For more about Yoga Alliance® and what their criteria is, please visit their website. The Yoga Connection is approved to certify qualified veterans for GI Bill® benefits for our Hatha Yoga Teacher Trainings. 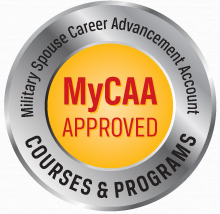 Our courses are approved for MyCAA Scholarships offered to military spouses through the Department of Defense. For more information about the program, and to see if you qualify, click here.